In a completely unexpected way, a couple of days ago, I got the afternoon off from work. Well, let me phrase a little more accurately. I got the afternoon away from the office, not working on construction drawings or alternate product proposals from the contractor. E-mails with clients and co-workers along with research for an upcoming meeting, yeah not so much. 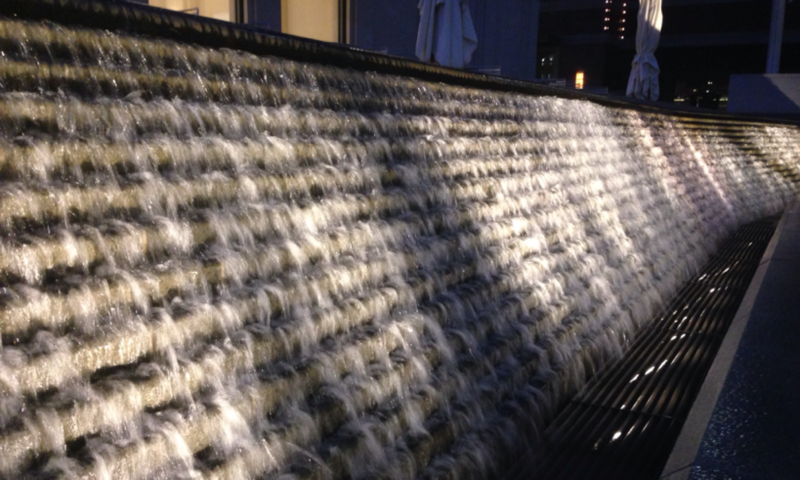 So how does an architect with my, uhhh, caliber caliper cali experience, score an afternoon away? Three little letters…. P V C. Well that isn’t confusing at, all is it? Ok, I guess a little back story is in order. About 2 weeks ago we had our first hard freeze in about the last two years. I think we actually had a temperature swing of 50 degrees in one day. I broke out my winter jacket, bought a new winter hat, found my gloves; dang it, it was down right cold. Then about 4 days ago, we had another one. Not as drastic of a drop, but it got cold just the same, and it stayed below freezing for a pretty decent amount of time. Now remember, I live in Texas so staying below freezing for more than a single night is considered a long time. Fast forward to today, and we are back up into the middle 70’s. Wow these have been some big temperature swings? I think we found the culprit. All this talk of temperature swings is bringing back memories of school, materials class, and formulas about temperature differential. A lot of formulas and homework to basically figure out that things get bigger as the temperature gets hotter. 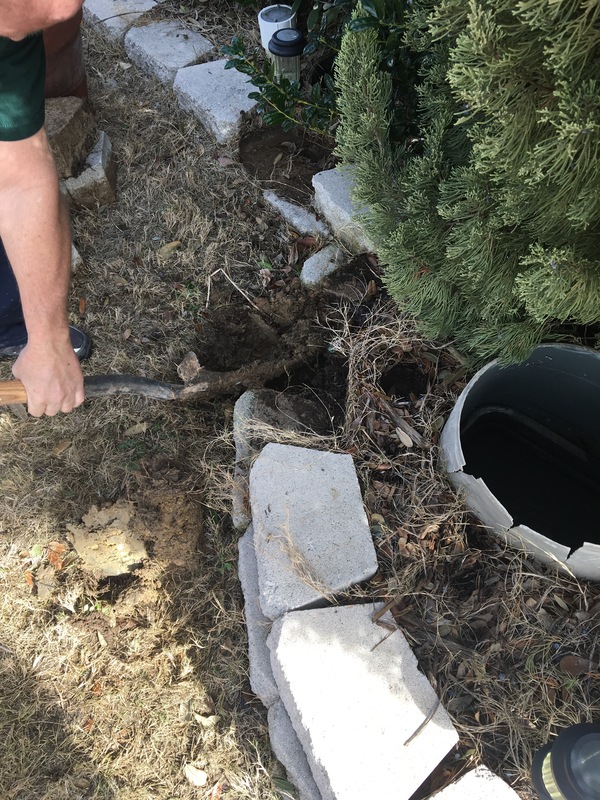 So looking at the picture above, this used to be a connection from the water line at the street (the top of the picture), my house (the bottom of the picture), and the sprinkler system (the elbow that goes off to the right). 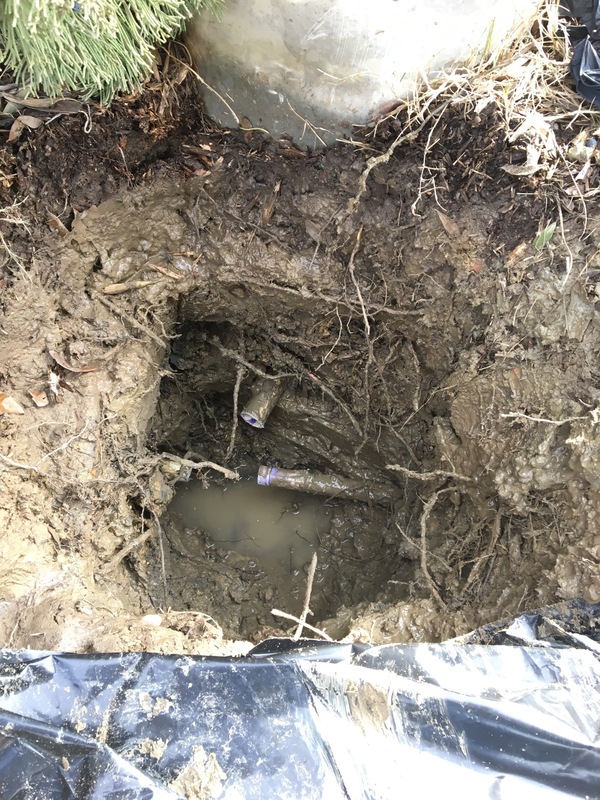 This nice looking connection was buried about 2 feet down in my front yard. With our daily changes of season we have had around here, I’ve noticed a few things expanding and contracting. Normal stuff like a door would be more of a tight fit on a warm day and a loose fit on a cold one, settling from the soil, things like that. But usually when this happens over the period of a couple of months everything can adjust slowly and still be ok, but when things happen over a couple of days, they don’t seem to like it as much. 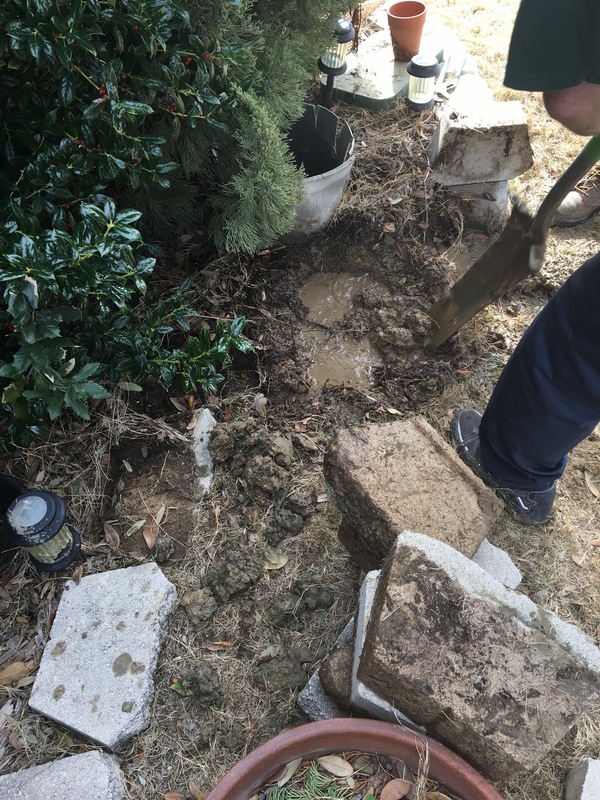 I think my water line had enough of it, and decided that it would make my front yard into a soft, muddy mess along with filling up my, and my neighbors, water meter box up with water, along with creating a nice stream down the street. Most likely for all the neighborhood kids to float their toy boats in. Not the best of sites to come home to after work. After a quick call to the plumber and a last minute effort to get everyone in the house to utilize whatever water they think they will need for the rest of the evening, I ran back outside to shut off the water to the house and get to wait till tomorrow afternoon when the plumber has an opening to get to my house. Oh… there is going to be a fun morning in my immediate future. Tomorrow finally gets here and I rushed home from work to meet them at my house to explain what was going on. You would think that after I explained the situation I am in to the person on the phone last night, that same information would have been given to the guys coming out to my house. Well you’d be wrong. I finished giving the two guys everything I could remember about what was going on, and the lead plumber (let’s call him Bob for the sake of simplicity) calls back to the office and I can overhear him say… “Go ahead and send the other guys to that next appointment, we’re gonna be here a while.” Yeah, I knew that was coming. So away he went, seeing what he could dig up, literally. About ten minutes into this adventure, we all started to hear that weird ‘squish’ when a shovel goes into really wet mud. I think we might have found something. We found water, yay! Wait, no, not yay. I still have a leak. 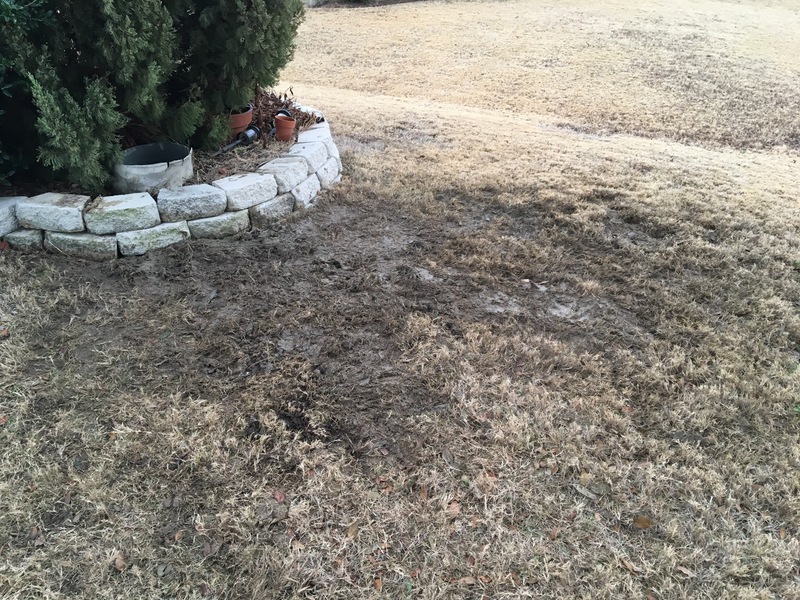 OK, maybe the short lived excitement is from the fact that instead of tearing up my yard in multiple spots searching for the problem, Bob seems to have nailed it on the first try. The water is shut off at this point, so water is flowing back into this new hole from wherever it rushed off to. Time for some more digging, this is going to be messy. Did someone order a mud bath? Deeper hole, more water flowing back into it, I hope we actually get to the pipe pretty soon. How deep are these things, and why did I never get a set of as-builts to know exactly where these were? I have to hand it to these guys, it was probably a solid 45 minutes to an hour of just back breaking digging. That soil was so wet and heavy, they definitely earned their paycheck today. After a bit more digging a hole, pumping out water, digging, pumping, digging, pumping; they finally see what they are looking for. But just to double check this is the problem, bob tells Tim (that’s what I am going to call his apprentice) to go turn the water back on for a sec. I didn’t get a picture of Bob getting a good spraying and yelling back to Tim “Turn it back off, this is it!” I didn’t laugh, I promise. So… How do we fix it? Remember that picture back at the top of the page, this is where it was cut out of. and by taking a longer look at that piece, we were actually able to with the utmost certainty of guys looking at something 11 years after the fact, determine what had happened. Well at least what would make the most sense to us. 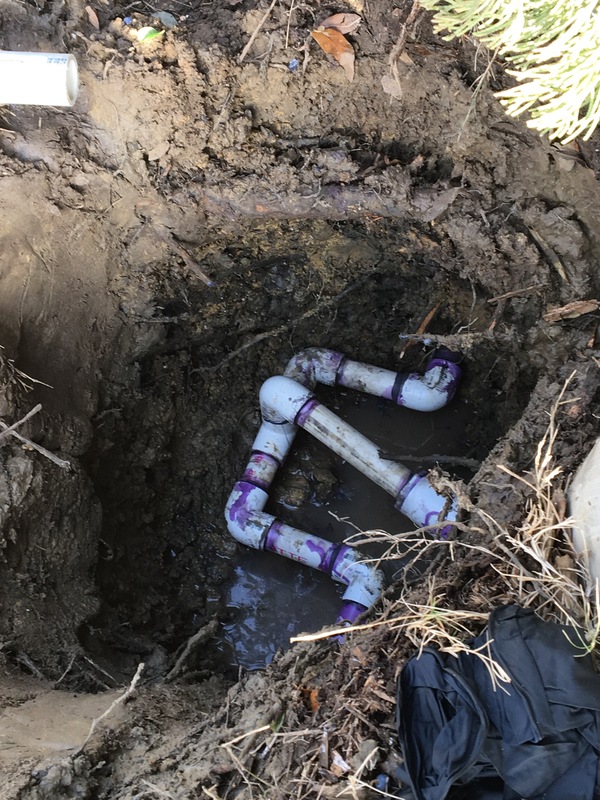 It appears that the sprinkler connection that went off to the side was actually added on after the main line had already been run. When it was done the person added the ‘T’ connection and was able to tap into it to get the water he needed. Just one step was forgotten, there was no actual PVC glue in the joint to hold it together permanently. There was some of that purple primer stuff, and that will hold it pretty good for a little bit, but not 11 years. Actually, the fact it lasted that long was pretty incredible. I get the feeling I’m going to be having to check the rest of the joints in the sprinkler system into the future. So with a plan in mind of how to fix it, Bob moves forward, with all of his pieces and parts beside him. Tada!! We have a brand new joint to feed both the house and the sprinklers using both primer and glue this time. OK, so now that we have glued it all together we can check the water, right? Yeah, not so fast, now we wait. Bob says we wait an hour for the glue to dry. He has seen it too many times where he tried to rush it and the water pressure just pushed right through the glue and you had to start all over again. Ok Bob, your the expert here, I want this done right. No offense, but I really don’t want to have to see you again anytime soon. An hour goes by, and while sitting inside I start hearing noises of toilets filling with water, air being pushed through the pipes, and all sorts of strange, but weirdly enjoyable sounds coming from my house. Do I have water again? Yes, success!!! 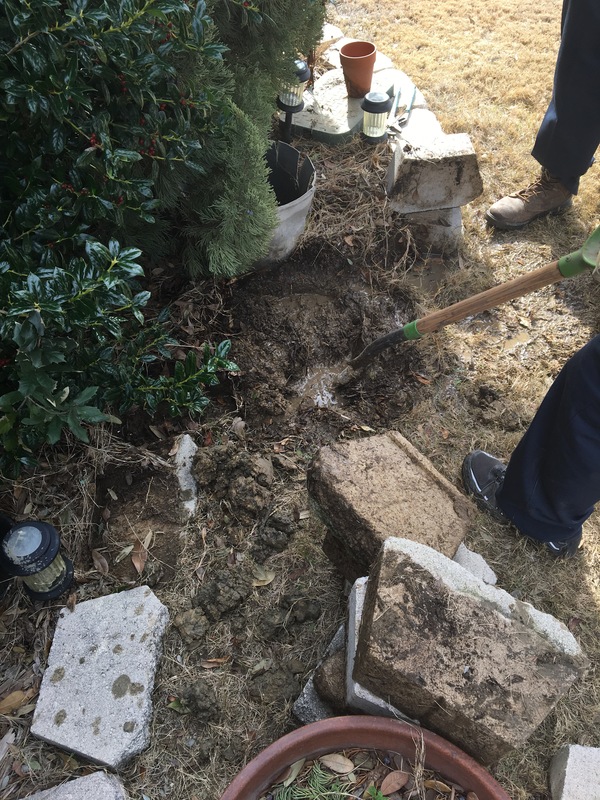 And even though they aren’t landscape guys, they at least attempted to put things back the way they found them. Not quite, but you know what, after everything they just did, it’s good enough. Now that this portion my yard has had a few really, really, really good soakings I think it needs some time to dry out a bit. Oh wait, this weekend is calling for rain…. figures. Well, maybe it will wash away some of the mud. 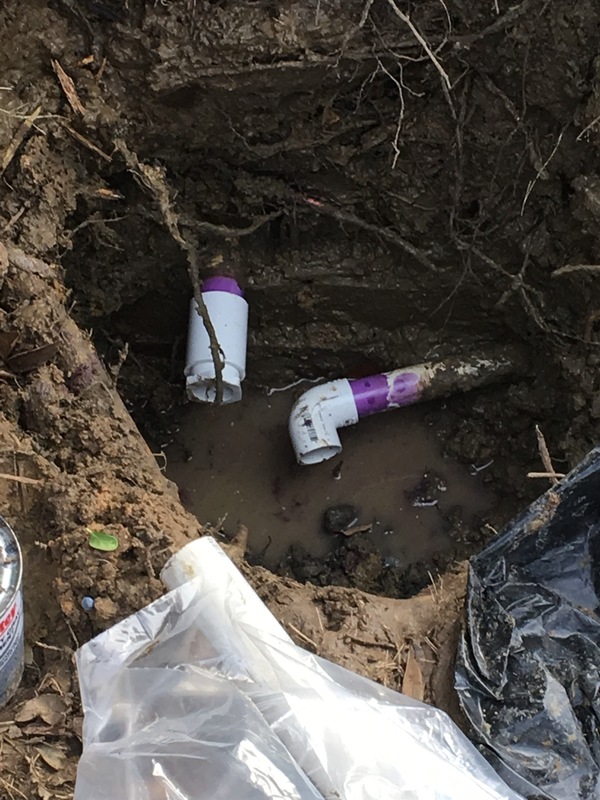 But on the bright side, I now know where my backflow preventer, pressure regulator, clean out, and main water connection are exactly. Don’t mess with me, I know enough to be dangerous now.